A great article about the local community cleaning up trash in the Moira River. Here is a quote and a link to an article in the Intelligencer about some of the winners of the Quinte Fishing Series 2010 Quinte Classic. The Asselstines had built up a substantial lead in earlier QFS events and managed to hang onto top spot when the top 40 teams hit the water last weekend. The walleye world website has been updated with the winners list. Visit the link below to view the standings and what they won. Its that time of year again and the opener is just around the corner. So that means the Kiwanis Walleye World 2010 completely LIVE RELEASE event will be held May 1ST and 2ND. The 30th Annual Trenton Kiwanis Fishing Weekend is approaching. Browse through our information, discuss it with your family and fishing buddies, and make your plans for the Fishing Weekend! Order your ticket today. A separate name and address for each person is required. Free 1st Quality commemorative hats will be given to the first 5,000 tickets sold, so don’t delay, order your’s today! Tickets can be purchased at any of the outlets listed in our registration section, or on arrival in Trenton / Belleville / Brighton / Picton / Napanee — but they are only on sale until Midnight, April 30th, 2010. The Empire Theater is holding a two hour seminar on invasive species. The Spring Walleye Institute is being hosted again at West Lake Willows Resort. 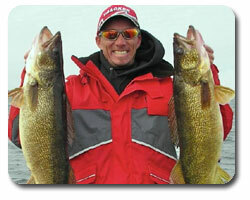 It is a great way to learn from the pros on how to catch big quinte walleyes. Sheldon Hatch and Gord Schultz are the instructors and they will bring a wealth of knowledge to the table. The dates are April 30 2010 – May 2 2010 and the class size is limited to 12 anglers (4 per boat) so sign up soon. At a amazing price of $349 per person (+ GST) which includes accommodations, continental breakfast, lunch, 6 hours in class instruction and seminars, and 8 hours on the water hands on experience you can’t go wrong. This weekend Canadian Tire – Belleville and The Quinte Ice Fishing Team will be presenting “The Quinte Hardwater Walleye Weekend.” Reps from various companies will be demonstrating their products and discussing hardwater walleye fishing in depth. Topics will include: Where to find fish, what to use, techniques, sonar, gps, mobility and more. There will be lots of giveaways and door prizes. The ORWL is a club established to promote walleye fishing in the Ottawa area. The club supports walleye fishing in a club competitive environment. We have a nine event competition series for club trophies in three categories, Boater, Non-Boater and Junior. Ethical fishing practices are a key club mandate, Catch, Record and Release procedures (CRR) are encouraged at all club events. Ontario has filed a motion, supporting a lawsuit which will prevent the spread of Asian carp into the Great Lakes that could cause billions of dollars in damage to the fishing industry. Ontario — the only Canadian province that borders the Great Lakes — joins U.S. states Indiana, Minnesota, Ohio, and Wisconsin in support of a lawsuit launched by Michigan earlier this month, demanding the state of Illinois shut down shipping locks in Chicago to prevent the Asian carp from spreading into Lake Michigan. Aquatic biologists warn that once the fish gets into Lake Michigan, it will spread uncontrollably into the other Great Lakes, and eat so much, it will starve off native species. DNA evidence has shown the fish are 10 kilometres from the mouth of Lake Michigan, close to a barrier intended to block them from infiltrating the lake. Lets hope this passes and they close the locks soon before anymore fish cross over. First Ice forming on the Bay! Today (Dec 11th 2009) was the first day of solid ice building on the bay. Above is a picture taken from Pete’s Point. You can see a good chunk forming near the shore but also another large piece forming off of Cow Island. This is a list of the lows over the next few days and as you can see its just going to get colder. Bust out the cleats we might be ice fishing sooner than you think.